How Much Does Rust Proofing Cost? Should Drilled Holes be a Concern? Is Rust Proofing Worth It? A vehicle is one of the biggest purchases that you will make in your lifetime. When committing to such a big ticket item, it’s advisable to find ways to protect the value of your investment for as long as possible. Rust is one of the biggest threats to your car and its resale value. In addition, the cost of repairing the damage done by any corrosion that develops can really add up depending on what component(s) are affected (paint, circuits, floor panels, etc.). One of the best ways to protect your vehicle and ensure you maintain its market value is to apply a rust proofing solution. Rust proofing helps to avoid, or even completely prevent rust and corrosion, but is the annual cost actually worth it? Solutions such as Rust Check, Krown, or Corrosion Free are applied by professionals every 12 to 18 months at a cost of $100 to $200. A drip oil spray is the option that professionals most commonly recommend. 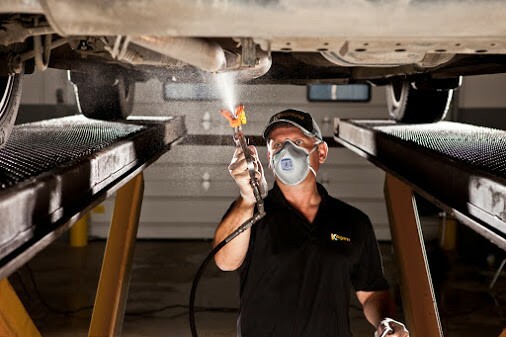 The process involves spraying a rust proofing product on the surface of the underbody that is designed to protect it from moisture. These solutions seep into the hard to reach door seam, joints, and crevices that are hotspots for rust and corrosion. The downside to this method is obviously that there will be some dripping oil after application. This can cause some stains if your vehicle is left in one spot, but typically the dripping stops after 24 – 48 hours. Small holes need to be drilled in order for the product to reach certain areas of the car (more about this later), and an annual application is typically recommended. Companies like Ziebart apply a dripless oil spray from between $120 – $140 per year, depending on the type of vehicle. A dense oil based solution can be applied to the entire body of the vehicle, including the underbody. This product is designed to prevent corrosion on the entire vehicle, and won’t cause any dripping after application. One of the issues with a dripless spray is the viscosity of the solution isn’t thin enough to creep into all of the spots that a drip oil spray can. Like the drip oil spray, holes need to be drilled, but due to the spray being applied to the entire vehicle, more holes are required. Electronic modules can be purchased and installed at shops such as Canadian Tire from $300, or can be installed at most dealerships. The price at dealerships, however, can be costly, ranging from $500 up to $1000. This solution involves an electronic module that sends weak electric currents through the metal of a vehicle. This theoretically will prevent a car from rusting by disrupting the electrochemical reaction that causes corrosion. This option is still relatively new, and the verdict on its effectiveness is still up for debate. Undercoating can be applied for about $150, and should be reapplied annually. 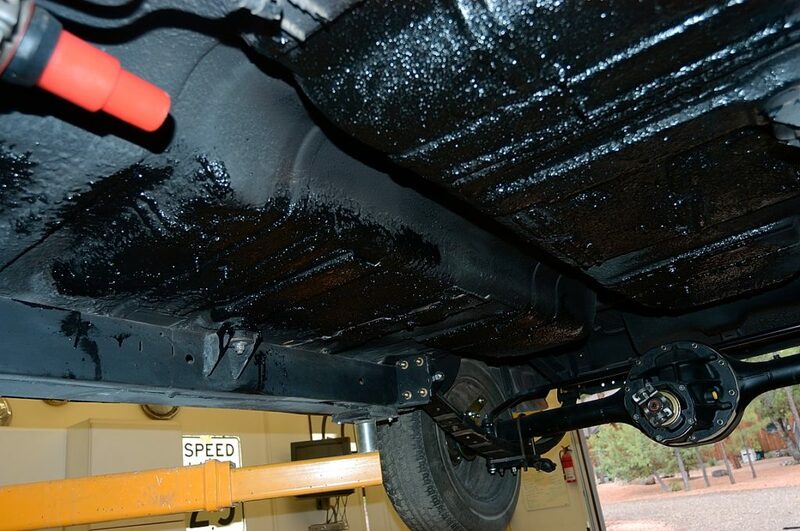 Most dealerships offer an undercoating option on new and used vehicles which involved spraying the underside of the vehicle with a black, tar-like solution. After hardening, the tar-based coating performs as a barrier, protecting the vehicle from water and other elements. This is a great short term solution, however the undercoating can chip away and cause moisture to actually seep into cracks, getting trapped under the coat and accelerating the corrosion process. The undercoating also doesn’t protect the rest of the car, and won’t be any help for areas already affected by rust or damage. Applications such as a drip oil spray or a dripless oil spray require a few small holes to be drilled into specific spots to ensure the solution can reach all of the necessary areas. It’s easy to understand the concern of a drill being taken to your car, however in reality it is only a minor inconvenience. When done by a trusted professional, any holes should be drilled in unnoticeable places such as near the door latch and on the underside of the vehicle, and will be too tiny to spot. The holes will also be filled in with stoppers, and no moisture or liquid will be able to get in. The benefits of drilling in order to apply a rust proofing solution outweigh the inconvenience of having small holes that no one will ever know are there. Exposure to water is the most common cause of rust on a vehicle. Puddles caused by rain, driving through snow, even humid air conditions are all ways water finds its way into the nooks and crannies of your car. This moisture, combined with the oxygen in the air, causes what’s called oxidization, which is essentially rust and corrosion. Other elements such as dry weather and the UV rays from the sun can accelerate rust and corrosion once the initial damage occurs. The underside of your car is completely exposed to anything and everything you’re driving over or through. In winter conditions, salt and other chemicals used for snow or ice removal make its way underneath your car and stick to the metal surfaces. The combination of salt and water is more damaging than rust, as the solution eats away at the metal, weakening it and causing it to fall apart. Salt and de-icing chemicals are designed to lower the freezing point of water, allowing your car to hit pavement in winter conditions. However this means more moisture exposure to your car, causing water (along with the salt and chemicals) to creep into all of the places of your car you don’t want it. Your vehicle has a lot of moving parts, and over time the metal components eventually show the effects of wear and tear. 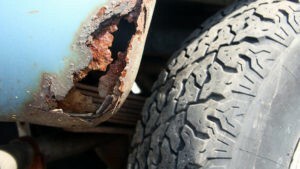 Neglecting to address wear and tear on your vehicle is going to result in premature aging and rust. Both of which will cost you more money over time than the cost of investing in proper maintenance. Choosing to forego rust proofing can result in more repairs more often, adding to the overall cost of your vehicle’s lifespan. Additionally, any corrosion that develops over the term of ownership can result in a much lower resale or trade in value. Rust proofing can be a great investment in your vehicle, but whether or not it’s worth it depends on several factors, including how much driving will be done, in what seasons, and how much longer you plan on owning the vehicle. For example, installing an electronic rust inhibitor for $1000 for a car that is only worth $10,000 doesn’t make much sense. That said, even if you plan to sell, having proof of regular rust proofing is a great selling point that can help you get a better price for the vehicle. I’m interested to know – do you rust proof your car? If so, how much did you pay and what type do you use? Let me know by leaving a comment below!